According to Fisher-Price, you can begin reading to baby as soon as they are born – you don’t have to wait until they’re able to understand the words you are reading. Reading to newborns and older babies can be a magical bonding experience for the both of you, especially when there’s plenty of cuddles involved, helping baby to associate reading with love and security. Research suggests that the sooner you start reading to baby, the more positive an impact it will have as baby grows. After all, they learned the sound of your voice in the womb - it’s one of baby’s favourite sounds! - so they’ll love listening to you read aloud to them. 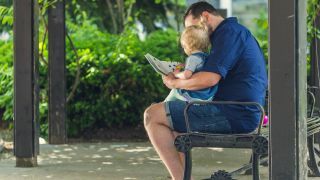 The Kids Health organisation has some good advice for how to read to babies, and why it’s so important, while Parents.com has reading advice based on your little one's age. Also, don’t be afraid to read the same book again and again if baby enjoys it. According to Reading Rockets, a Library of Congress Literacy Award-winning program, reading the same story to baby strengthens their language development. So, ready to stock up on babies books? There are dozens to enjoy, but we’ve rounded up the following titles based on popularity and glowing reviews from parents, educators and children’s books critics. With nearly 3,000 reviews on Amazon US and over 300 five-star reviews on Amazon UK, Goodnight Moon is a classic bedtime story that’s still enchanting the minds of little ones today. This poetic story follows a little rabbit - wearing striped pyjamas, no less! - as he prepares for bed, saying goodnight to everything in his room and outside his window. There are big, colourful images for baby to look at, and gentle rhymes for you to have fun reciting. Goodnight Moon is available in a variety of editions, including a baby-proof board book. Goodreads baby book club members adore this picture book by Eric Carle, which has a 4.29 average rating from over 300,000 reviews on the site. The Very Hungry Caterpillar , bursting with mixed-media collages, tells the tale of a newborn caterpillar happily munching his way to becoming a strong, confident butterfly. Little fingers will love exploring the holes the caterpillar leaves behind as he crunches and munches his way through the story, and we guarantee you’ll be smiling too when the caterpillar finally takes flight as a beautiful butterfly. In Kate Banks’s Junior Library Guild Selection best-seller Close Your Eyes, a mama tiger encourages her restless cub to sleep by describing the dreams he may have, reassuring him that when he awakes she will be there. But the little tiger worries that if he closes his eyes for just a moment, let alone to sleep, he will miss too much of the world around him. Mama tiger settles him by painting dreamy scenarios of the magical places he'll see once asleep. Georg Hallensleben’s illustrations bring each scenario to life, giving your cub plenty of hypnotic images to gaze at. Encourage your baby to grasp and develop their fine motor skills with Julia Donaldson’s short and sweet lift-the-flap book about a wee rabbit that’s desperate for an afternoon nap. The trouble is, each time Rabbit curls up in a comfy chair to sleep someone taps on the window. So exhausting! Help your baby to lift each flap, peppered throughout Rabbit's Nap (Tales From Acorn Wood), to see who and what is keeping poor Rabbit awake. Described as 'The best book ever published for babies' by Books for Your Children, with a Sunday Telegraph reviewing stating that 'Surely no one - baby, child or adult - could fail to enjoy Peepo! ', this modern classic continues to delight babes today. In Peepo! a young baby in the forties glimpses the world through small details (a circular cut-out on the page), before the entire scene is revealed (ie, you and your baby turn the page). The board book edition is perfect for little hands to grasp, hold and pull. Cuddle your little one close as you read them the heartwarming story of Little Nutbrown Hare and his dad, Big Nutbrown Hare, as they attempt to express their love for one another. In a series of exchanges, baby and dad try to sweetly one-up each other, with declarations such as [I love you] ‘all the way to the moon – and back’. Little wonder Guess How Much I Love You, which focuses on unconditional love, has sold over 18 million copies worldwide. Your baby will love hearing the sing-song tone in your voice when you read aloud the lilting rhymes in Each Peach Pear Plum. As this is a picture book for very young babies, at first the focus in on simple, repetitive sentences, but as baby gets older you can help them to take part in Each Peach Pear Plum's delightful I-Spy challenge. The cartoon-esque illustrations are warm and playful – ideal for catching the eye of your bambino. Another modern-day classic from Julia Donaldson, creator of The Gruffalo, available in a baby-proof board book format. In The Snail and The Whale, a teeny snail who longs to see the world cheekily hitches a lift on a whale’s tail. Together, the unlikely twosome set off on an inspiring journey. The snail soon feels intimidated by the great vastness of the world, until the mighty whale is beached in a bay and it’s the tiny snail to the rescue. This baby book is filled with stunning illustrations from Julia Donaldson's long-term collaborator Axel Scheffler and has thick, easy-turn ‘board’ pages for baby to grasp and touch. Aimed at very young babies, Baby's Very First Touchy-Feely Book is a feast for developing senses. There are high-contrast images for baby to focus on, coupled with tactile patches of fabric to bring the big, beautiful images to life and to help your baby develop those all-important sensory skills. This padded 'soft touch' book can even be propped up in front of baby for them to explore in their own time. Aw, good old Spot! You may remember this precious pup from your time as a tiddler, as Where’s Spot?, one of the original pioneers of lift-the-flap babies books, has become a true classic, inspiring many imitators and spawning its own mega series. In Where’s Spot? the mischievous puppy has gone missing at dinner time. Sally, Spot’s mama, sets off to find him. The simple yet enjoyable narrative will be music to your baby’s ears, with plenty of bold and colourful illustrations for them to soak up.